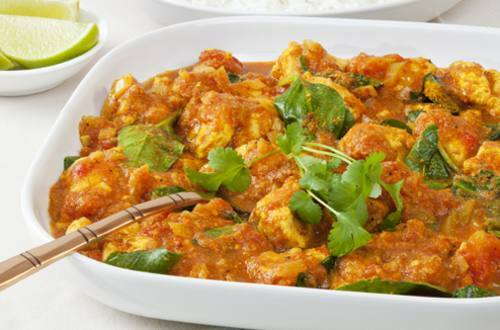 Restaurant style paneer cooked in rich tomato gravy with butter and infused with aromatic spices. 1 Take the chopped tomatoes in a grinder and grind them to make the tomato puree. Take out the puree in a bowl. Soak the poppy seeds and cashew nuts in warm water for half an hour. In a grinder, add soaked cashew nuts and poppy seeds and grind it to make the fine paste. 2 Heat oil in pan add cumin seeds cardamom pods and allow it to splutter, add ginger garlic paste and fry for 30 seconds. 3 Then add tomato puree. Cook it on a medium flame for 2-3 minutes or till oil separates. Now add ground cashew paste, turmeric powder, red chili powder and coriander powder, 1 tbsps. Knorr Chef's Royal Vegetable Masala. Cook the spices on a low flame till oil shows separately. 4 Add 1 cup of water (150 ml). 7 Serve hot and enjoy.